During my parents' and my second stint living in Duanesburg, NY (after Valparaiso, IN), I was living alone for a few months, in nearby Amsterdam, NY, doing graphic design for Amsterdam Printing & Litho, a company that prints business info on the sides of pens, logos on mugs, etc. I was part of the graphic clean-up crew. Because of certain limitations in the printing technology, I had to tweak even the good images, so that they would end up looking good on the final printed products. Anyway, to make a short story long (something at which I excel), I showed my personal portfolio to Heather, my boss, and "INVASION" (http://nudistpoet.com/invasion-final.jpg) was one of her favourites. 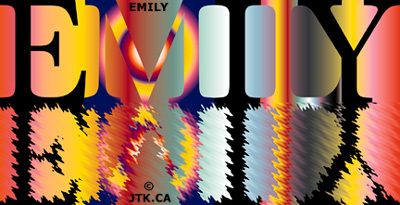 She also liked my graphic version of the name "EMILY" (http://nudistpoet.com/emily-name-art.jpg), inspired by Emily (Cronin) Barajas, one of my best friends while studying at Valparaiso University (http://www.valpo.edu).